2: the top landing, is a tripping hazard; almost trip twice. 1st when we moved in, 2nd nearly fatal. Apologies for renovation clutter. We had to stop carpeting the stairs once we saw the wood was quite decent and need to decide which way we want to proceed. Hi, you don't say what age the house is but the stairs do look to be fairly normal and not home made so I would imagine they are original. Looking at your last photo the step with the box with GWC written on it, does that go anywhere? 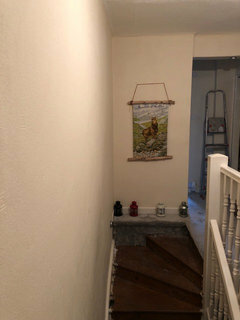 Could it be that somebody has filled in a door that used to be at the top of the stairs? I can't quiet see from the photo. 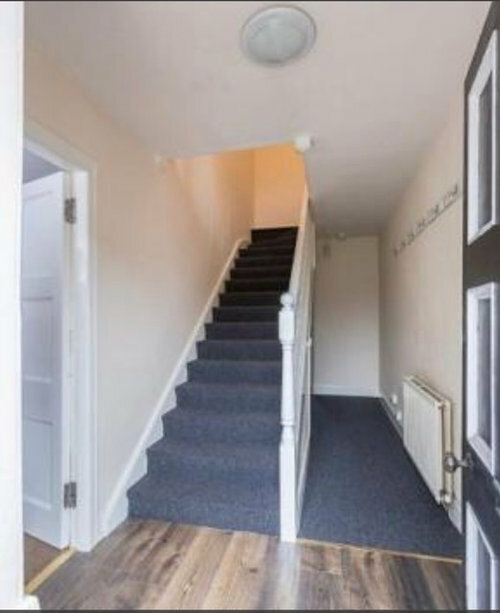 My neighbours stairs are very similar at the top,except they have one room straight ahead( where box is) and then another room on the turn to the right,is your house a conversion? I live in a early Victorian road of terraces and the stairs look very similar construction to ours. 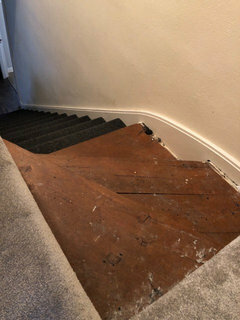 I'd say original staircase, with the possibility that the little bit of the top is a DIY Hash and should be removed. You should be able to tell from the way the stringer runs along the edge. If you move the boxes and stuff out of the way and take another pic it will be easier to tell. 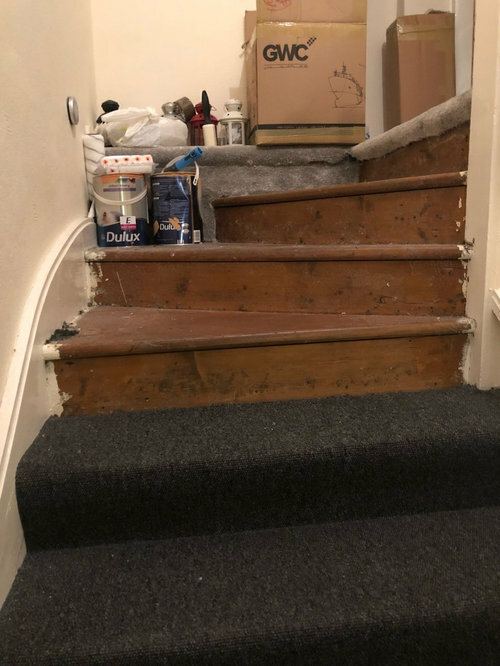 Also, if you took the carpet off of that bit, you would probably be able to tell straight away as the wood will almost certainly be different to that of the main staircase. I can see why you tripped! Those steps that turn do not leave enough room for two feet. 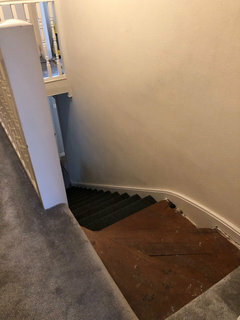 Someone I know lives in a tiny Victorian house in London and has even worse stairs, and they are original! Hers are incredibly steep and it’s like climbing a loft ladder, horrible. My stairs have a mini landing near the top so you can turn a complete right angle to reach the landing. Here’s a couple of pics of mine. 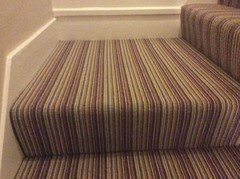 I wonder if a stair company may be able to alter them for you safely? I'll post pictures of the landing in the next 24 hours. The house was built in late 1800's. But to me, it seems somewhere in the 1980's there was quite a bit added on.. (based on styling and materials used). Behind the GWC box is a wall, which is a stone / hard structure, again I assume it's a structural / load bearing wall. What is behind the wall? A room? The outside? The utilities will have been added at a later date and likely put there to hide them away. It is possible to move meters etc. but this can come at a high cost and inconvenience (moving pipes etc.). The coordination of getting them moved can also be a challenge as a lot of tradespeople and energy service companies are reluctant to move them for no good reason. You would also need to consider the aesthetic value of moving them - meters in the hallway or on the front of the house (they must be easily reached). Your hallway looks quite roomy as it is anyway! I was wondering about this one last night. I think that at some point ( and I'd like to know where the bathroom and drains are ), that it might be covering a soil pipe or water pipe to the outside as there wouldn't have been a bathroom upstairs..............it has to be covering something and that's my best guess....................so i'm intrigued. 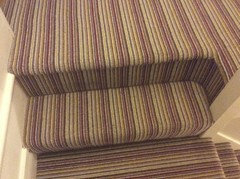 The addition at the turn of the stairs could also have been added to allow a bookcase or similar item to be placed at the top of the stairs as it creates a flat area of flooring with the top step. Not very safe but you never know what previous occupiers thought looked good! Please can you take the carpet off and tell us all what you find - I am also intrigued! 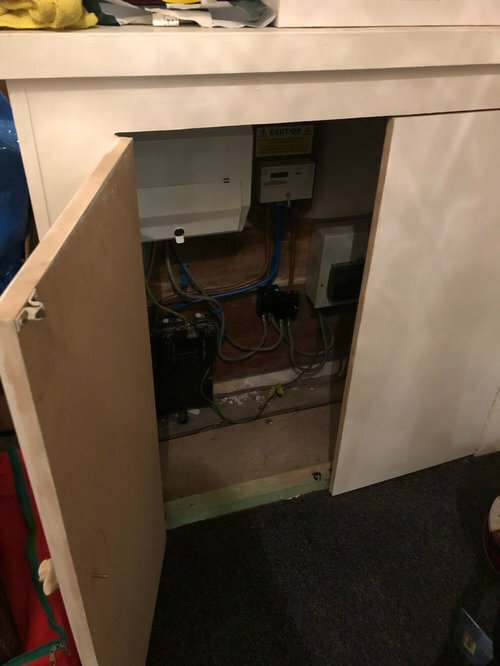 Is the meter cupboard accessible from the hall or is it inside the area under the stairs - I can’t see how it fits in with the items around it. Has a doorway in the lower hall been blocked off? It seems strange that there is a corridor parallel with the stairs in the lower hall that leads to no where. This makes this area ideal development - could you open up the area under the stairs to make this area larger? 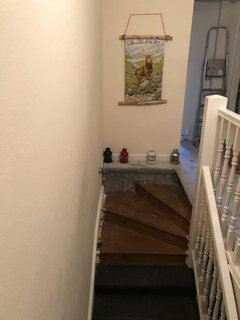 Hi, As per previous comment I can't visualise what the whole area under the stairs is like. Appreciate it may be tricky to get a photo, but could you sketch it out? Also, a rough house plan of both upstairs and downstairs might aid commentators in helping you out. What practical feature/item do you secretly crave for your house?